What a title! This is the first in a series of fun things to do. I plan on posting many more for all the seasons. I’m dividing these up specifically so that it’s easy to find something fun to do, no matter the circumstances. 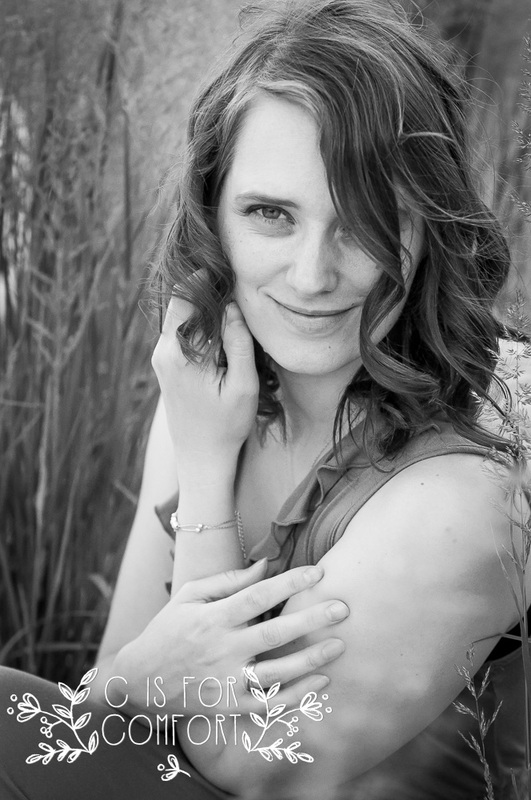 For this part in the series, I’m focusing specifically on fun things to do, at home, outside, in summer. 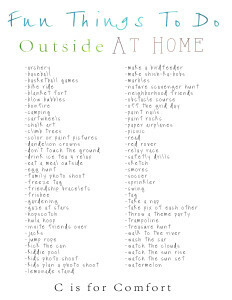 I don’t know about you, but some of my best memories of childhood take place outside. I can remember running through the streets with all of the other kids on my block. We were completely unsupervised and free to use our imaginations. I honestly can’t remember my Mom guiding our play. 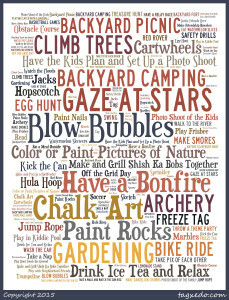 Unfortunately, in today’s world, it is not safe to let the kids run free and wild outside. Sadly, I’ve heard many stories in the news about parents being investigated by CPS if children are allowed to walk to the park themselves. I know that in today’s world, children are being kidnapped and sold, so a simple walk to the park is a thing of the past. If you’re like me, you want your babies to be safe AND have fun. So this means that the kids might be contained to the yard. Usually, I let my kids outside to play on the trampoline and all the neighborhood kids will come running over. However, there are days when no friends can come to play. If this is the case, I turn to my handy list of things to do. 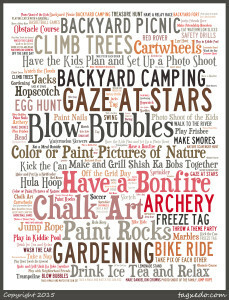 Here is a free summer fun printable. I like to keep mine inside a plastic protector sheet inside a binder. I’ve seen a lot of fun ideas about putting the lists on popsicle sticks and the like. Although that idea is neat, for me, it just means a lot of work. 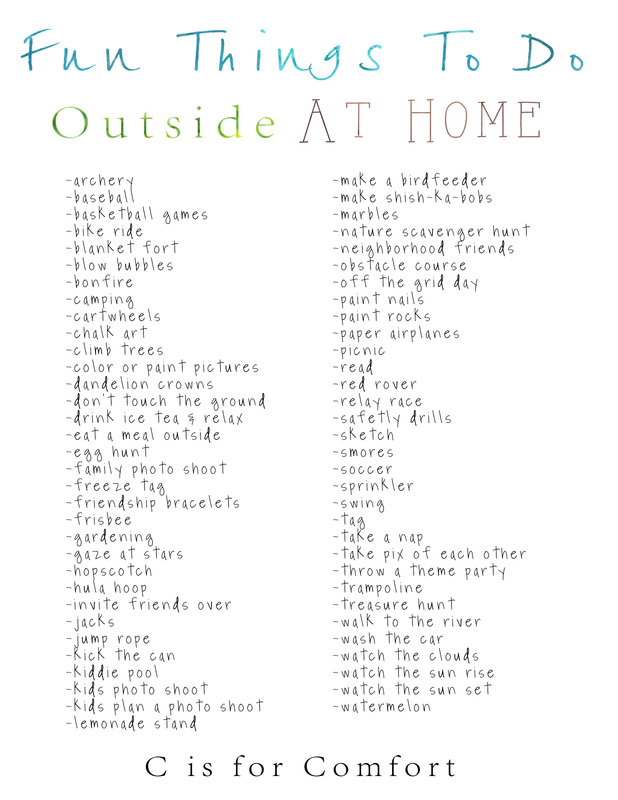 Not to mention more clutter and the chance that the kids will lose, break, eat, leave lying around the house, etc. 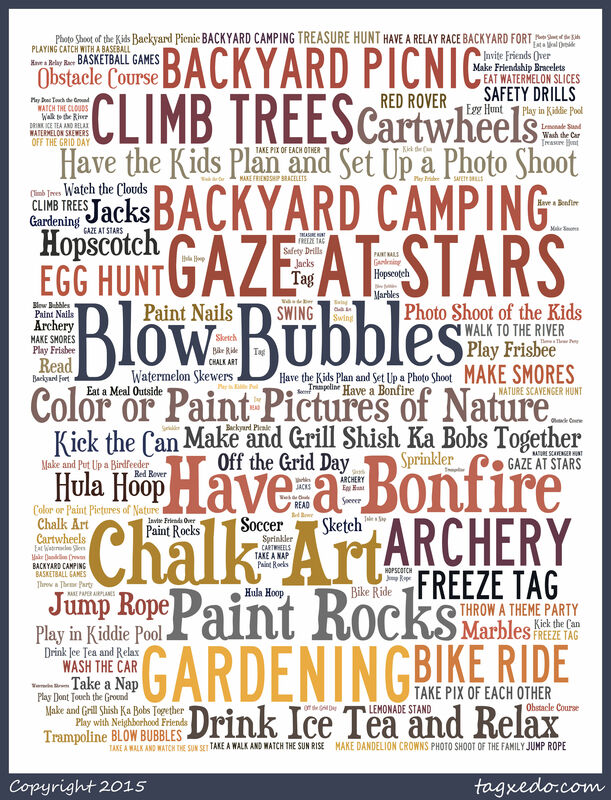 Here are a few 8.5×11 summer fun printout freebies. 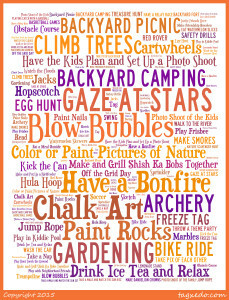 I made these with Tagxedo, but you could always make your own with your favorite summer activities. 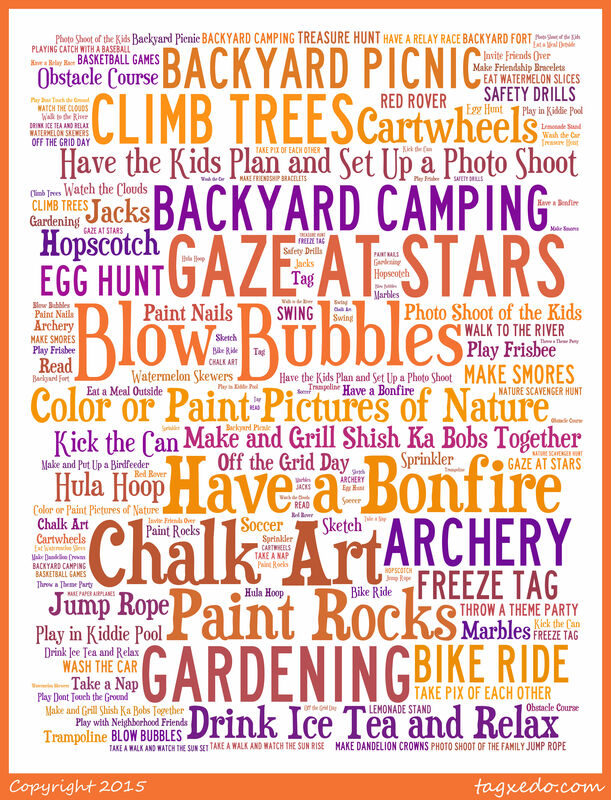 For more information and ideas for these activities, check out the links below. Over the Summer I’ll be picking randomly from this list, so check back often! 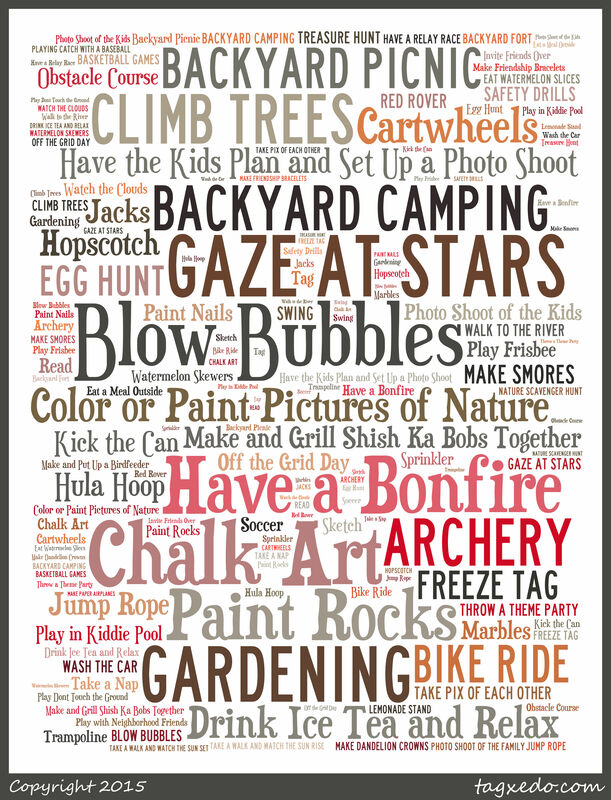 What are your favorite fun things to do, at home, outside, in summer? We’d love to hear from you! Let us know in the comments!